The United State rugby team gets its last chance to win a game in the 2015 Rugby World Cup when they take on Japan at Kingsholm Stadium in Gloucester on Sunday. For Japan, a win would make their third place finish in Pool B look a bit healthier, but even with a five-point bonus win they would fall a point short of taking the runner-up spot from Scotland. It could have been much more meaningful if on Saturday Samoa had defeated Scotland. Then a win by Japan over the United States would have put Japan through to the quarter finals. Or, the U.S. Eagles could have played spoiler to Japan and helped the Scots through. But Samoa couldn’t quite get it done, losing 36-33. In the quarter finals, Scotland will play Australia, the winner of Pool A after defeating Wales Saturday 15-9. South Africa gets Wales in the quarter finals. New Zealand and Argentina advance from Pool C, but won’t know their quarter final opponents until after the Franc-Ireland game on Sunday. A win by the Eagles on Sunday would do a lot to restore some belief in the outlook by U.S. Coach Mike Tolkin that things are headed in the right direction for U.S. rugby. After the 64-0 drubbing by South Africa, fans could rightfully be skeptical of Tolkin’s optimism. As he says in the video above, the U.S. did pretty well in the first half (as they did against Samoa and Scotland), holding a full Springbok team to 14 points from two tries that came only after they had to “work their way down the field.” Then, as he says, South Africa got going in the second half, scoring 50 points. Tolkin sees the problem correctly — many young players in the lineup with little experience at the international or World Cup level. He saw good performance by individuals but not as a team. For the game on Sunday, Tolkin is starting 13 players who were not in the South Africa starting 15. Only Samu Manoa at No. 8 and Zack Test, a winger, remain from the game played on Wednesday. As for U.S. rugby, he says things will get better. “Four years down the road, it will be interesting to see what happens in the game,” Tolkin said in calling for international rugby to continue investing in “tier two” nations. As he said after the Scotland game, the U.S. side would improve with more professional experience. “Half my guys will have to go to work on Monday,” Tolkin said, and that will not mean going back to play on professional teams in top tier nations. It will mean resuming jobs as plumbers, fitness trainers, etc. I like the idea, but I remain skeptical. 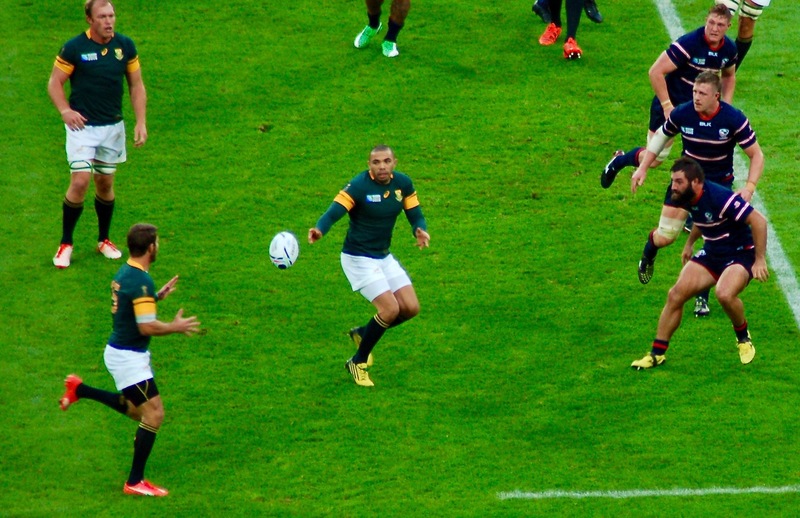 Bryan Habana delivers a pass in the game against the United States. He scored three tries in the game to tie Jonah Lomu’s record of most tries scored in the World Cup (15). Posted on October 10, 2015 October 11, 2015 by jbsaulPosted in RugbyTagged Japan, Mike Tolkin, rugby, Rugby World Cup, RWC, Samoa, Scotland, South Africa, USA Eagles.